Termites aren’t like other pests that might take up residence in your Arizona home. Once they get in, they go to work eating the cellulose in any of the wood they find – wood that holds up your walls, your ceilings, and your floors. Wood that provides the structure to your furniture. Termites eat that wood around the clock, day in and day out. They don’t stop until there is nothing left to eat. You can hire professionals to apply a termite treatment in Chandler that can eventually eradicate the problem, but extensive damage can be done by the time you get rid of the termites – or even before you identify that you have termites in your home. By the time you notice damage, the termites have already been at work for a while. Termites tend to be in spaces that you don’t see all the time, such as the beams in your walls and ceiling. When damage gets to a visible place, the termites have typically already done significant damage to the underlying structures. It is important that you take steps to keep termites out of your house and protect it from this devastating damage. Getting a regular termite inspection is the first step, followed up by routinely checking for signs of termite damage yourself, such as sawdust near the base of walls, peeling wallpaper and bubbling paint, or insect wings near your doorways or windows. Termites are attracted to moisture, which is why you need to ensure that your attic and crawl space are properly ventilated and have to eliminate sources of standing water around your house. It is also important that you repair any leaks in your home as soon as possible. That includes leaking faucets, pipes, and connections to your air conditioning unit. Even small leaks can cause water to collect around your home or inside the walls, which can attract termites. Inspect these connections regularly and have leaks fixed as soon as they are discovered. The weather stripping around your windows and doors are essential to keeping moisture out of your home. Even small cracks in this stripping can let moisture in, and even small amounts of moisture can attract termites and other pests. Inspect your weather stripping regularly to make sure it has no cracks or other issues. You will need to replace it regularly even if there are no signs of wear since the plastic can break down over time, making the stripping less effective. Of course, termites are attracted to wood, and they will start their invasion of your home at pieces that are connected to the soil, such as fences, decks, patios and railings. You can reduce this risk by using treated lumber for these projects. Treated lumber contains chemicals that protect it from weather damage and that slow the decomposition process. Those chemicals also make the lumber less hospitable to termites. If you can’t use treated lumber, you can minimize the risk of termites by keeping the wood off the ground. Use concrete pilings or other lifts to create a barrier between the wood and the ground. Termites usually enter your home through the foundation because it is closes to the ground where they live. You can find the earliest signs of a termite problem by regularly inspecting the foundation for signs of mud tunnels nearby. You can prevent termites from entering by looking for cracks in the foundation and filling them immediately. Even the smallest cracks can let termites in, so don’t leave any cracks behind. Termite prevention requires more than hiring a termite exterminator in Chandler for an occasional inspection. You must be proactive in protecting your home. These tips will help you keep termites out or identify the first signs of a problem so you can treat it quickly. 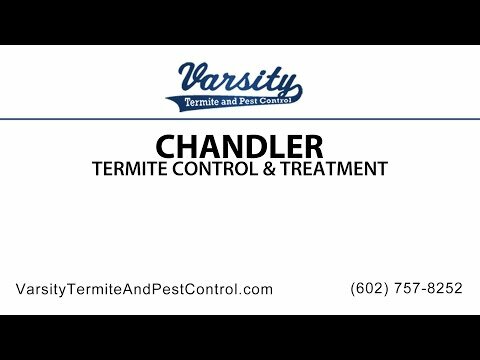 Varsity Termite and Pest Control has a variety of options for termite treatment to protect your Arizona home. We offer a free termite inspection to determine if you have a problem, and we can provide tailored recommendations for termite prevention for your home. Call us today to schedule your inspection or to learn more about your treatment options. We also offer treatments for scorpions and other common Arizona pests.